Bintzler Incorporated has the skills and equipment to tackle any fabricating and/or welding task necessary. Machining capabilities are also available. With over 100 years of combined experience, Bintzler Inc. personnel are experts at what they do. The phrase "I can't because" is not accepted at Bintzler. We use the phrase "I CAN because". Welding capabilities include: MIG, solid wire and dualshield, TIG, and stick. These can be performed in mild steel, stainless steel, and aluminum. Bintzler Inc. has fabricating equipment in house to shear, form, burn, plasma cut. Virtually any operation necessary. 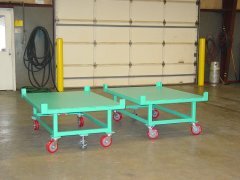 Pallet racks, workbenches, custom tables, and any other miscellaneous parts can all be fabricated. All that is necessary is an idea, and Bintzler can make it happen. Whether the need is for brand new, or repair an existing item. We have designed many items to suit a specific need for some of our local customers, and for our out-of-town clients as well. Custom fabrication is never a problem. Bintzler Inc. also fabricates tanks to meet almost any situation, size, and shape. No job is too small, or too large. We fabricate tanks for all of our finishing lines, as well as special tanks for a specific purpose. Tanks can be insulated if needed, heat can be installed, whether electric, steam, or gas fired into a heating tube. 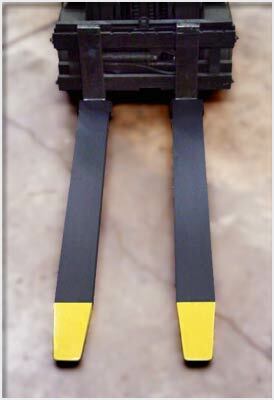 Tank stiffeners are always provided when the tank size and situation require them. Bintzler Inc. is also quite skilled at modifying material handling equipment. Changes to fork trucks, tow vehicles, personnel transporters, pallet movers, outrigger trucks, and more have all been done to suit one situation or another. We manufacture approximately one hundred sets of fork extensions per year.